Concealer can definitely be a hit or miss product, because we all have different preferences when it comes to face products. Especially in the drugstore! Recently I've been on a hunt for some good and affordable drugstore concealers, which was quite a challenge if I'm completely honest. As we all know drugstore shade selection can be pretty bad, especially if you are pale like me - I need to always use my St Tropez Gradual Tan beforehand so that I can use the lightest shade available. Even though all the shades are quite dark to begin with, I love the fact that they mostly have warm undertones for us NC gals. So in today's post I decided to feature my 4 favourite drugstore concealers that I've tried out and don't break me out! (excluding the Maybelline The Eraser Eye Perfect & Cover Concealer because I couldn't get a hold of it + I still need to try out Collection Lasting Perfection Concealer). This is my newest drugstore discovery and has quickly become one of my favourite concealers. It gives a great, very natural skin-like coverage with a long-lasting wear time. It covers my dark under eye circles perfectly, makes me look well rested and brightens the under eye area. It has a very creamy consistency and dries down nicely and not cakey. The consistency reminds me a lot of Nars Radiant Creamy concealer. I like to use it both on top of my foundation or on its own. It's very bleandable and most importantly doesn't break me out! A thing to warn you: it can be quite drying, so you definitely have to moisturise beforehand - it will crease a bit unless you really prep the under eye area. The only thing that bothers me are the weird shade numbers: the lightest shade 10 is way too dark for a pale complexion, shade 15 is the lightest in the whole range but it's very cool toned. So I went for shade 20, which is still lighter than 10 and is warm-toned. So be careful when choosing the right shade for you! Bourjois’ Healthy Mix correcting concealer is great for both covering dark circles and correcting any imperfections. It has a nice fruity scent to it - apricot, raspberry and melon (if you have tried out any of the Bourjois face products before, you'll know what I'm talking about) and lovely, very useful packaging. Even though it has quite thick consistency is still very easy to blend. It provides medium, but buildable to almost full coverage and lasts a long time. It goes on creamy and then it turns powdery - again be careful to moisturise. So if I had to criticise I would point out that it is a little dry, but a decent setting spray will fix that quickly. I use the lightest shade 51, very yellow/warm-toned which suits me best. I absolutely love L'Oreal as a brand in general, so these two concealers had to be a part of my favourites - both available at a very affordable price! This one feels the most lightweight on the skin out of them all. True Match concealer gives a lovely light to medium coverage, blends seamlessly with your skin and makes your skin looking flawless and not cakey. It has a lightweight formula with a creamy texture. It's a great option to reapply throughout the day, because it won't cake up. I use the shade 2 Vanilla, which is the perfect match for me, so I can use it both on top of the foundation or on its own. I absolutely adored and raved about this concealer for a very long time, but they have recently changed the packaging and the formula. It's great that the colour selection is still the same and that you still have two different options - cool and warm toned (mine is in the shade Ivory Beige). The new formula is not as good at covering dark circles and blemishes as it was before, but it's still long wearing, quite matte and brightening. It provides good coverage and is very easy to blend. I also love the twist up packaging. That's why many people describe it as a budget-friendly version of the YSL Touche Eclat with a slightly more matte texture. 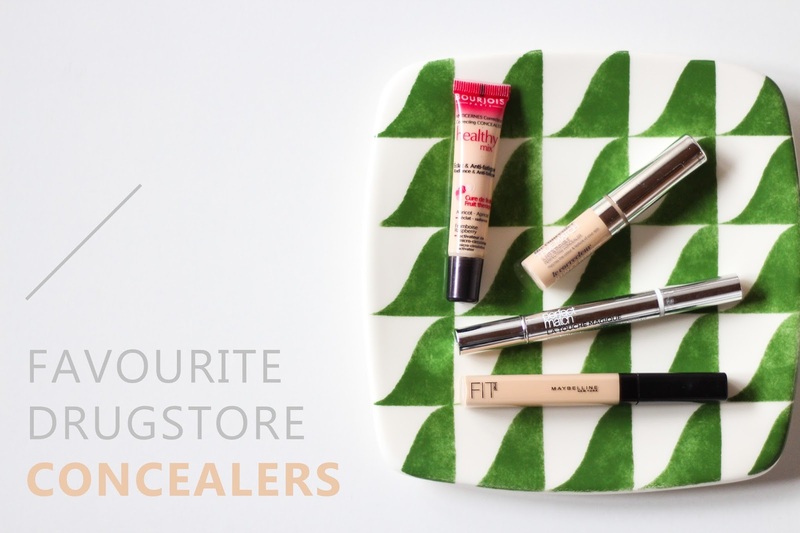 Let me know in the comments below your favourite drugstore concealers that I need to try out!